The Chancellor of the Imperial Order of the Dragon of Annam is Colonel Tran Van Ba, who is a well known Vietnamese patriot who served for many years as the Colonel-In-Chief of the Imperial Guards Regiment of Vietnam. Colonel Tran Van Ba has served the Imperial Nguyen Family of Vietnam for many, many, years and dedicated his entire life to the protection of His Majesty Emperor Bao Dai, and also the late Emperor's mother, Her Majesty, Dowager Empress Doan Huy Hoang Thi Hau Tu Cung. Colonel Ba, currently lives in exile, and resides in Virginia, in the United States of America. He served as the last Colonel-in-Chief of Emperor Bao Dai's Imperial Guards Regiment, and was based in the ancient Capital of Hue. Since his exile from Vietnam, Colonel Ba has continued to serve the Imperial Nguyen Family of Vietnam, and has travelled frequently to France on various meetings concerning the Nguyen Dynasty. 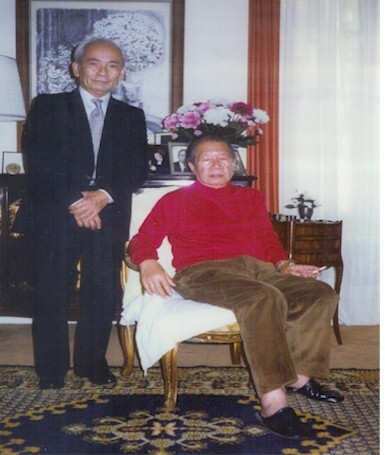 He last met with His Majesty Emperor Bao Dai shortly before the Emperor's passing in 1997. In August 2004, he contacted His Imperial Highness Prince Nguyen Phuc Buu Chanh and very kindly offered his services, as he had learned that His Imperial Highness Prince Buu Chanh was appointed Regent of the Imperial Nguyen Dynasty of Vietnam by Prince Phuc Buu Phuc, in Cannes, France. Colonel Tran Van Ba has served as Chancellor of The Imperial Order of the Dragon of Annam since his appointment in September 2004. 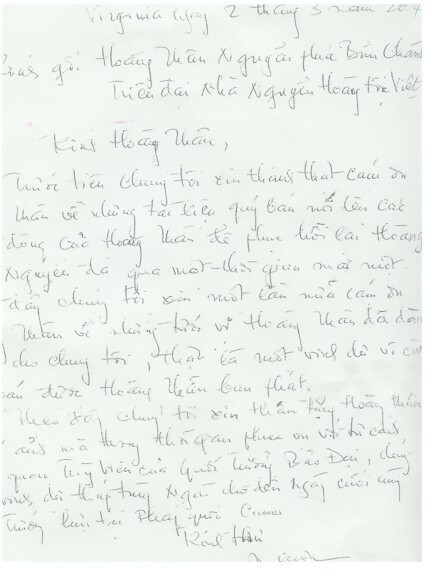 First, I wish to sincerely thank Your Imperial Highness for the most interesting and invaluable documents that you have kindly sent me which outline all of your current projects and activities on behalf of the Imperial Family, which strives towards the restoration of the Imperial Nguyen Dynasty to its former Glory. I wish to sincerely thank Your Imperial Highness once again for the noble titles that You have bestowed upon me. Thank you. The titles are extremely prestigious and such an illustrious honor from Your Imperial Highness is a singular distinction. I was serving His Imperial Majesty Emperor Bao Dai, Chief of State in the appointment of an Attaché Officer. I was very honored to loyally serve and follow His Majesty until the last days, when He resettled in Cannes in France.